Generating new ideas is the key to success. Your project might have ended at work or there is a delay. You may be at a point where you're in between assignments or jobs. Things have slowed or come to a halt in your life. Then you need to focus on one important principle that has driven my life. The key to success: use downtime to generate new ideas and improve. One of the books that changed my life was Napoleon Hill's Think and Grow Rich. I read the book every January for a decade and marked notes and goals in the margin. Come the next January, I was able to review what my thoughts were a year earlier. Surprisingly, most of the goals I had written in the margins of the book had been attained or exceeded. At the time, I was a stand-up comic working my way up the ladder. I went from an open mic night to becoming a regular in Las Vegas - the Entertainment Capital of The World. Not bad for a guy with no confidence. Even though my walk with the Hill classic was in January, I held his principles with me throughout the year. At the core of Hill's philosophy is the generation of ideas. You need to be an idea generation machine. 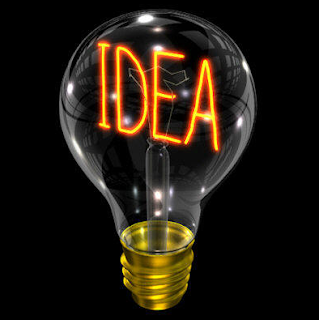 New ideas improve your work conditions, your family, you life. Ideas are at the core of everything that is. We rely on them for innovation, changes in our work environment, changes in society, new medicines, new technologies, etc. Recently, I suffered a near death experience, in terms of being a blogger. My computer died, and I could not replace it. For two weeks, I had no computer. I went from working 12 to 20 hours a day, writing, researching and marketing this blog to 2 hours a day at the library. After replying to messages on social nets and email, I had no time to write to the standards I've set for myself. But I didn't waste the time. I'd take a few minutes every day to check out something new while I was on the library computer. I found new gadgets, a couple new marketing sources, etc. I also stuck with my number one rule in life: Always carry a pen with you. Paper you can find anywhere, but damn if you can't find a pen when you need it. And a screwdriver just doesn't work. Every day, I went somewhere and talked to people at bars and restaurants. I asked a lot of questions. Then, I'd grab a stack of napkins and sit in a corner and write. I generated story ideas for the next year, If I work round the clock I'll get them all written within a year. It's been three weeks since my computer died. I got it back, just over a week ago (too much dust built up on the processor and it was overheating - an air compressor took care of the problem). I'm still trying to get back into my rhythm and reach the level of work flow I was doing before the blackout. But I came away from the downtime with a plethora of new ideas, new tools, new perspective. I'm better for having the time off, not injured. Sure, my page views per week went from 9,300 to a low of 1,950 - but today I'm back up near 3,700 and headed in the right direction. If you've never read Think And Grow Rich, I've attached a terrific video that is a simple scroll of quotes from Napoleon Hill's work. It takes five minutes. There is no narration, so you can sit at work and just read the quotes. You might want to email this post to yourself and look at it from time to time, just as a reminder of what it takes to be truly successful. Share it with friends that are adrift, lost or even those moving up - it will help all of them. Success seems so illusive to some and so simple to others. It takes hard work, but before you can do anything, you need an idea. The key to success: use downtime to generate new ideas and improve.